We are conveniently located on US Route 206 in Hillsborough, New Jersey. 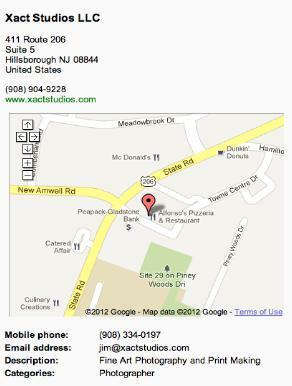 Xact Studios is the Epicenter of activity for local and regional Digital Artists & Photographers. From High Quality Digital Capture, to Digital Display and Fine Art Printing, our Master's offer consistently superior results worthy of Gallery Exhibition. Bring in your digital images for consultation. We can analyze them and recommend the best way to present your work. Whether it be "Digital HD Display", "Digital Projection" or "Fine Art Print", we are suitably equipped to work in all of these disciplines.